Courtesy DMI, streamers (left), all over the place, low strati or stratocumuli-form clouds displaced by the winds. the heat injected effectively blunts Arctic winter from being stable and much colder. 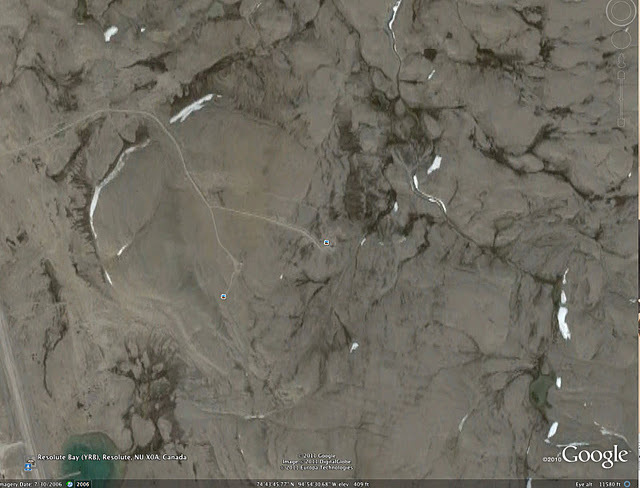 Google Earth wonderful older pictures show it, Cornwallis island September 19, 2009, autumn snows stayed on hill tops. But still note the small glaciers, everywhere with places having shadows. Since 2009 they disappeared even more. immediately affecting weather is overrated, it has to be thick ice, which always precedes the vast clearing of the early winter Arctic atmosphere by fomenting anticyclones to build. This clearing is late by about a month. Bad news for stratospheric ozone, already the upper atmosphere is very cold, twinned with very warm lower troposphere this spells severe weather in the works for spring of 2012. A repeat of severe weather precursors implies the same type of weather between spring 2012 and 2011. Everything else is the same as projected earlier. A warmer wetter winter is still very much in the cards. But winter late season attack is also fore coming. Unless El-Nino kicks in. Note, most of this weather projection for the larger part of North America is due to Arctic Ocean transformations, ENSO does matter, so does the Rockies, Prairies, Atlantic and Indian Oceans, not to mention the big chunk of land called Eurasia. The biggest 'now' player is from the Arctic because its weather is out of whack more than all others, because its been excessively warmer here. But the first blast of cold Arctic air will still frighten Europeans, not enough Canadian or Russian to know what winter really is. 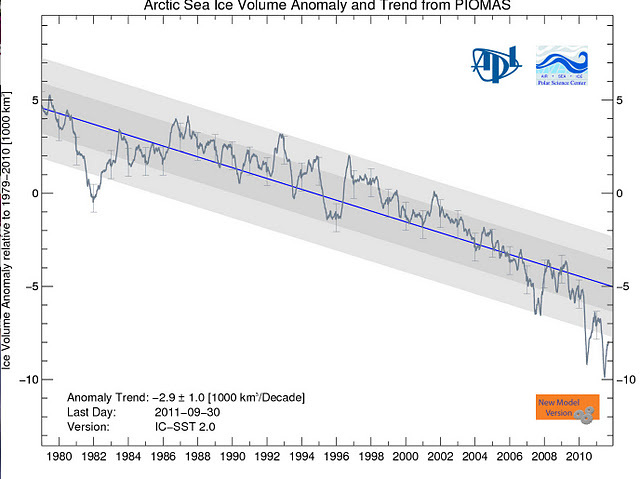 The blue trend describes the eventual end of Arctic sea ice. Old multi-year sea ice, thick beyond 10 meters, once upon a time spanning the entire Arctic Ocean is left to exist a jagged sliver parallel to the NW Canadian Arctic Archipelago. This old ice is key to the existence the very survival of the Arctic Ocean ice pack, because old ice tend to procreate thicker ice than if the entire pack started from scratch. during its refreezing only surrounding ice begets ice, and not from great open expanses of open water. Darkness and cold air do not create ice as fast unless there is a calming presence rendering the sea surface relatively steady. Multi-year packs slow the winds, smother sea waves which greatly hinder the process of ice formation. Even with colder air temperatures than -11 C, open sea water may last a long long time, even all winter given the right wind, current, tide and wave conditions. Without the presence of the fall time pack, ice is left to freeze from the shorelines, deeply frozen land being a proxy of old ice does freeze the sea surface similarly and helps form new ice but not as quickly as when water is surrounded by thick rugged ice. 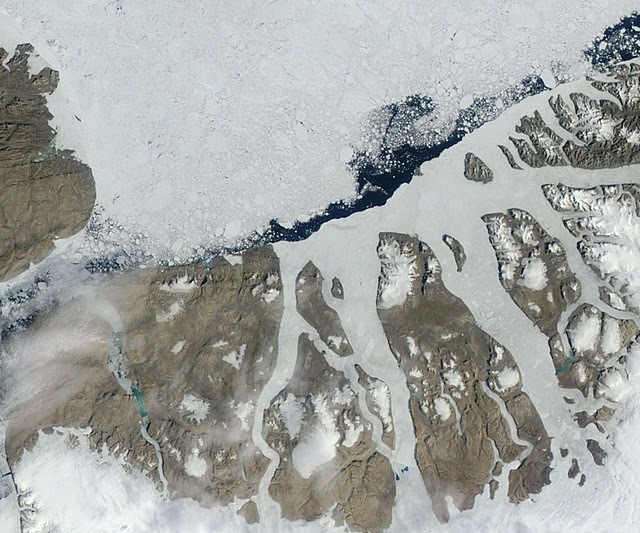 The very survival of old ice will deny a complete summer melt. When the old ice becomes extinct, the beginning of the Arctic Ocean being completely blue during the long day will start, measuring iceless days will then be the new necessary observations to judge further warming progression, which will eventually give way to a remarkably free of ice Arctic ocean likely year round. 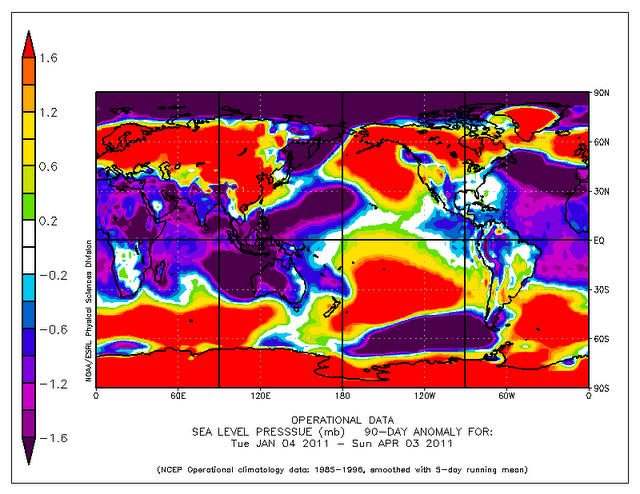 open sea water, now -2.2 million anomaly. Fram Strait on the 17th didn't show that much ice loss, but this may be misleading, because sea surface is warmer and melting may be rapid there. Redoubt at twilight 1989. It would be better if the sun was in the background, but the streaks are similar definitely more mixed with moisture and volcanic ash. Other examples are not so common, but volcanic ash cases seem fairly moist and more white. 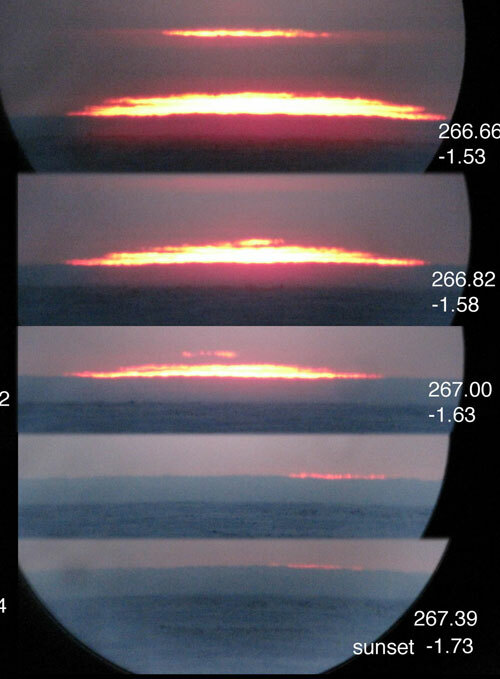 (A1) 2010 25 October Arctic residuals, these streaks are well above a cotra (condensation trail) seen here in red (the sun was about 4 degrees below the horizon its light was red at jet level). 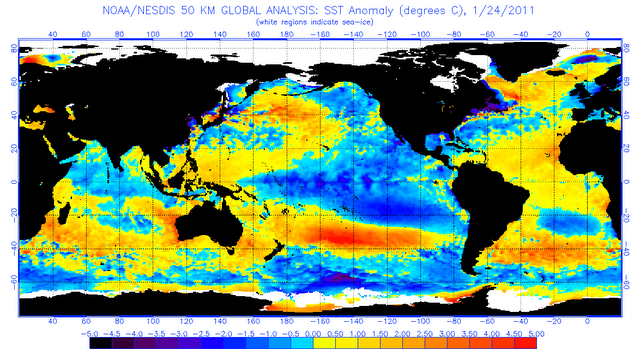 2010 had a moderate El-Nino. (A2) I suggest Arctic CCN's can be seen in the orange or yellow sky. They are dark streaks uniquely seen at twilight, perpendicular to the sun rays. Resolute Sep 24 2011. 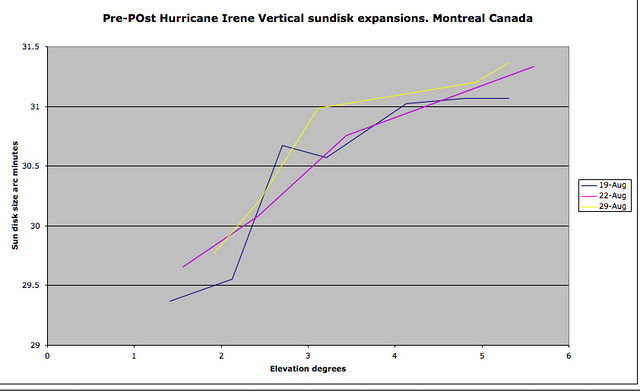 (B) Montreal June 28 2011 had more CCN's than August 23 2011 when ENSO was trending towards La-Nina. (C) Same as in (B) darkening the pictures enhances the streaks. (D) June 15 2010 when El-Nino was stronger cloud seeds appeared more numerous as well, capturing them on digital camera is relatively difficult. Human visualization is immediately apparent, but only if you realize you see them. (D) a view of your eyes can see by darkening the image. What may be CCN's on top of Cirrus at 35-39000 feet near LaGrande Northern Quebec. The camera shot is back to the sun position. They may look small, small white patches, in fact small perineal glaciers, because they are on hill sides, they appear non significant , but they are, some were in place for more than 1000 years. What voice do small glaciers have aside from the visual impression of winter they whisper in the wind, despite mid-summer sun beating on them they outlived countless years. Now Gone, their ruins remind of colder winters once upon the Arctic. Awaiting the latest 2011 Google picture of the same spot over Cornwallis Island. Gradually they melted away as well as everything of ic e in the Arctic. 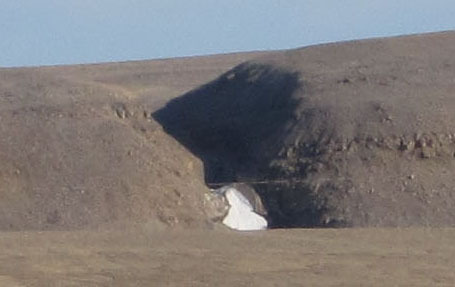 Resolute Bay Ice cave, since the beginning of Resolute in 1947, a visitors mecca, this picture was done 2001. The cave is gone like the past, its crumbled remains lower down. There was once at least 5 small glaciers on these flanks. 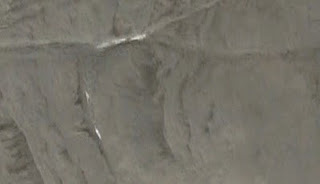 The Google Earth picture of 2006 showed a few. The number of small glaciers lost are staggering as seen in this july early 90's picture. The melt was gradual, finally really apparent about 2008. Most of these glaciers were over permafrost, now these grounds are directly exposed to direct sunlight. 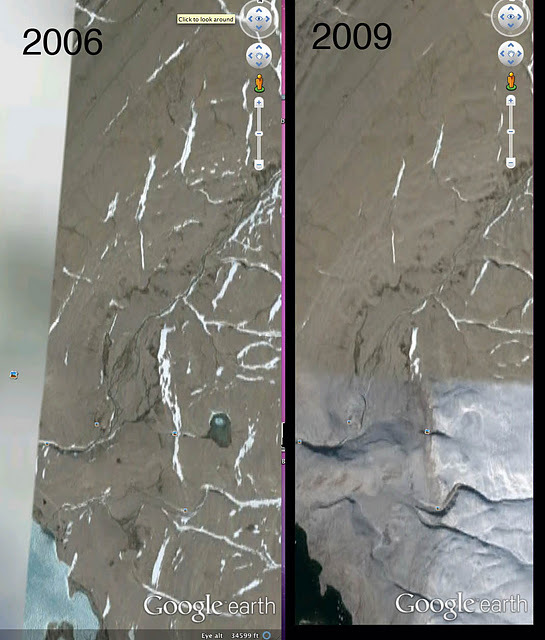 In 2006 a Westward glacier still survived in its Northern Part. By 2009 all of its southwards component was gone. June 1989 this it what the south part looked like, quite large, interconnected with smaller ones,. In the past, complete melting of these glaciers was difficult, and surviving the summer was routine. An iceberg from Greenland, huge besetting on sea bottoms moving with Natures whims. Same iceberg different look on three occasions, The optics here are mainly driven by inferior mirages, the sea water is warmer than the surface air, but on one occasion the iceberg appeared risen above water (left) along with an inferior mirage projection. Distance may include many such distortions. These visual transformations can tell what is ongoing with the air between the camera and the objects in its field of view. BOM shows the effect of summer more often than not killing El-Nino either burgeoning or in full swing. 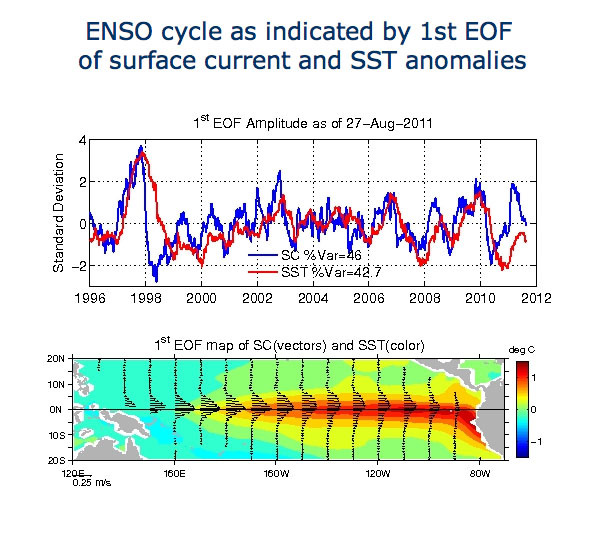 ESR's blue plot seems to always precede ENSO temperature trends, despite an apparent El-Nino forming it slopped cooler. Stalled at present, a winter switch in progress? A red give away, digital camera don't pick up dark streaks otherwise known as cloud seeds only perceived well with human eyes at sunsets. 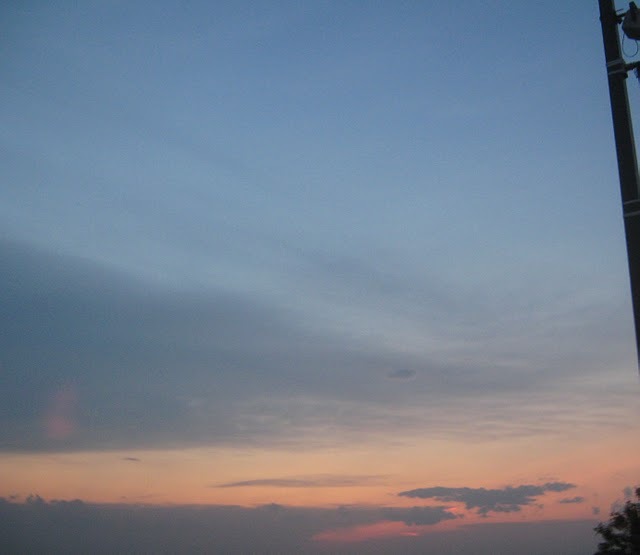 In june they covered half the horizon sky. At August end only 1/4. Synchronized with the sea cooling off the equatorial Pacific. Image darkening reveals the streaks. Consistently seen less often at end of August, now is a matter to see if El-Nino will re-trend back the graphs to the warmer. The question is, what happened? The colder upper atmosphere should have weakened summer's assault on El-Nino, was it a larger oceanic phenomena? Perhaps not, El-Nino is also a product of lack of winds at the equator, La-Nina the reverse is stronger when the wind gradient is driven faster by higher pressure at the Poles, usually after December, this wind engine kicks in strong in the Northern Hemisphere especially if the North Pole to equator pressure gradient is particularly strong, as it turns out the pressure gradient during this past 3 months was steep between the equator and the Poles, this blunted Pacific equator warming trend interestingly seen in the NH spring, to even reverse it fast by August end. El-Nino usually actually starts by July-August resulting to its signatory peak by December. The Northern Hemisphere temperature gradient should dramatically change from June to December, this is why EL--Nino usually flames out in January, preceding La-Nina which should weaken starting end of August. This year was particularly off this cycle, when El-Nino trending kicked in late from a very warm Arctic winter, then faded when El-Nino should kickstart, returning ENSO to neutral favoring great equatorial cyclones at the peak of the hurricane/typhoon season. But latest atmospherics favor still an El-Nino late phasing once again, perhaps explaining the latest stall in La-Nina trending, remains the few months of visible High Arctic Horizons to catch a significant upturn in evaporation as seen through more cloud seeds. However all seems right to contradict the latest analysis calling for persisting ENSO neutral conditions. To be certain must wait for better intel from the sky. It is nevertheless stimulating to witness ENSO cycle deviations, in particular with respect to the world wide pressure gradient and zonal air mass anomalies. There is no doubt Hurricanes bring heat along with violent weather, as recorded one day after it passed over Montreal to the Northwards. The sun disks largely expanded, despite much cooler surface temperatures, this depicts the power of refraction readings, it measures the temperature of the entire atmosphere. -What may seem normal for Americans may be perceived differently when observed for the first time elsewhere. Awing Montrealers one July 21 2011 evening, the "demon" single Cumulonimbus mumerous lightning discharges seems to have repeated itself throughout Southern Ontario, highly likely with lower cloud heights and weaker capping inversion. A visual statement of the nature of the air above, violent weather is mostly achieved by twin conditions, warm or hot surface with colder Upper Air immediately above. All while quite hot North American summer was covered by a much cooled atmosphere. Multiple sun disk measurements from June to August were unusually flattenned , confirming the potential for continuance of severe weather as started last spring. Hot to cold air profiles vary throughout spring, summer and fall. When surface heat is extremely strong the balance is skewed in favor of more stable warmer weather, as was summer so far. But spring and fall is more balanced between surface heat and cold upper air. It seems that all Canadians are experiencing what they perceive as new weather events. Old news, more strongly felt in the Arctic but now just as much awesome for Southern Canadians. This is consistent with a slow but gradual climate change, more often than not, variations in weather events are dismissed as normal, but comes a time when extreme events exceed the variance. This should make people think and realize the magnitude of weather transformations. As hurricane Irene approaches the very same dynamic described above should be studied. Usually having high pressure anticyclones near the North Pole was common, now its back, unfortunately right at the wrong time for sea ice extent, vulnerable, particularly thin, like a boxer on the ropes getting pounded mercilessly. The immediate impact of more clouds was less melting ice over Beaufort. Still, the greatest noticeable change is the collapse of an old ice bridge from Pole to western Russia which acts like an ice damn, fortunately weather systems do not favor Eastward winds which would clear even more pack ice. Courtesy Cryosphere Today. 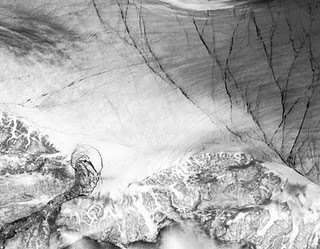 Wind tracks show a dismally disorganized flow of ice, which literally stalled a greater disappearance of Arctic Ocean ice. 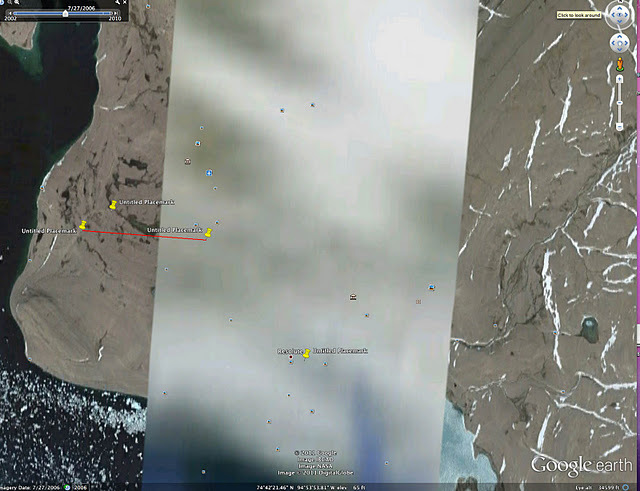 Clouds now dominate the Arctic ocean areas, this will prolong the melting season since the sun is quite low in the sky. ~ Some newly released videos demonstrate a few faint thunder sounds or wind hitting the camera microphone. 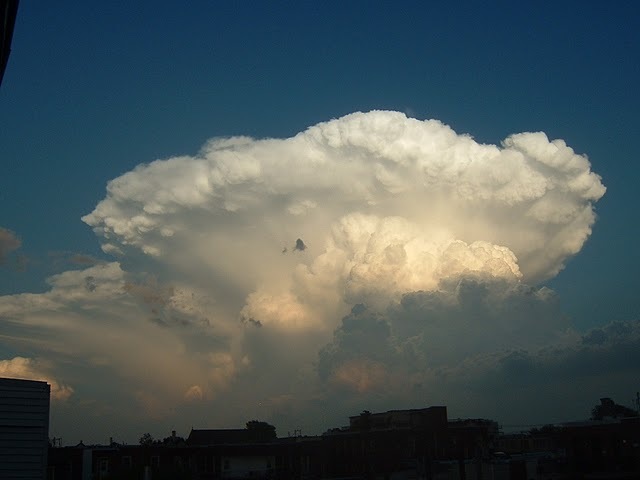 ~ There is a possible refraction explanation for not hearing thunder when a cloud is a few Km's away. A single cloud, apparently loaded with electricity, has perhaps 2 andvils, the first tropopause overshoot had another smaller cumulonimbus. right hand smaller CB ahows the beginning of a first andvil. , more filmed than perhaps any cloud ever, lucky happenstance for further studies.Already after a few days of internet publications a single Cumulonimbus stunning in beauty and cloaked in mysteries has fascinated people worldwide because of numerous thousands lightning bolts it gave all or most without any sound. The main reason for this cloud is extensive heat on surface coupled by colder than usual air above it. There were other CB's in the vicinity, none had lightning. There was very little apparent wind shear. This made it quite vertical reaching 50,000 feet. Unusual for Montreal itself, it appeared a few hours after the hottest temperature recorded in Montreal's history. It unleashed lightnings in the thousands from late evening well onto the night. 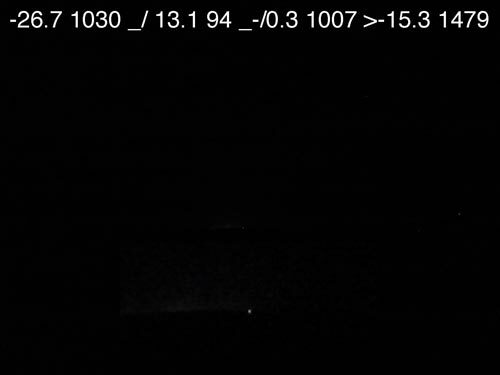 312 lightnings video was taken at 9 M, from the center of Montreal, as the storm crossed the St-Lawrence, discharges continued when it was over the South shore of the St-Lawrence. Showing more lightnings not captured from the West, well scattered but more heavy over the NW quad of the cumulonimbus. Another take from further West Laval Quebec from the same direction of 312 lightnings camera. As seen on this video, there appears to be a single source of charge. 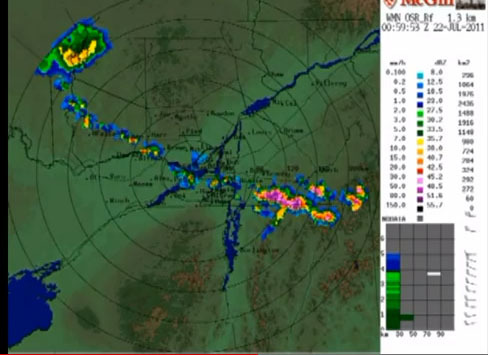 On minute 5:30 of a storm chaser video the same lighting was filmed from Granby Quebec 84 Km East of Montreal, big puzzle, no sound, and as this video shows the radar sequences of 21 July 2011, there is no far away echo to the south of southwest from Montreal... By triangulation, the likely closest huge target was over Valleyfield 74 Km away from Montreal, but it doesn't align with the westward videos. My calculations based on top height of 9.7 miles brings this cloud a lot closer, and according to earlier echoes it was, very close by, astounding, no thunder sounds, there is no other possible explanation unless the cloud didn't show on radar at all. The cumulonimbus passed over Montreal and it is quite certain that the lightnings made very little sound. 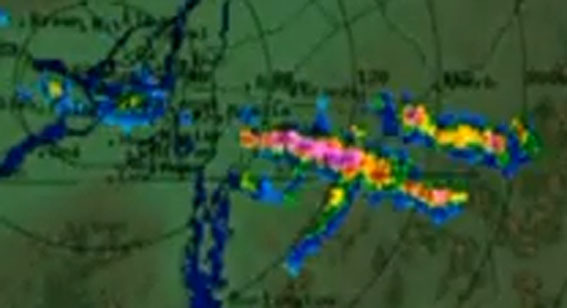 As per the "demon cloud" video proves, aligned with the biggest Montreal streets, Rene Levesque, Sherbrooke and Ste-Catherine, with camera from the Northeast. The cloud passed just East over the radar station, moved Southeastwards within a main system Eastwards bound giving the illusion that it was stationary. The most important being with a camcorder right under the cloud from the South shore south of Montreal. Amongst many lightnings you may hear a muffled sound or two, amongst hundreds of bolts, a great mystery... . This one with a neat 360 view from about downtown. 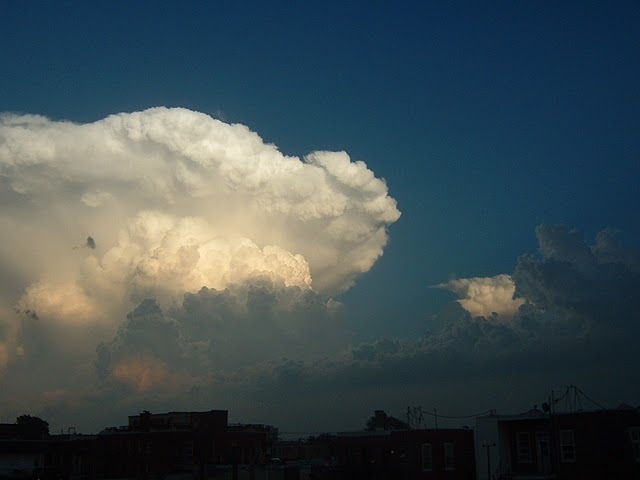 From downtown, again no sound, with possibly thousands of bolts, the cumulonimbus crossed the St-Laurence. Very long video of the event. From famous Downtown Ste-Catherine street (no time) but some muffled thunder sounds or wind on moving camcorder. Old Montreal date time and location is very useful. Some faint sounds of thunder can be heard, but the cloud was very near. The warmest day in Montreal history had a 6.2 degree elevation sun disk which was one of the smallest in the last 10 years. Very latest upper air data has shown a trend in colder upper air, steady and prevalent as will be related by latest refraction analysis. 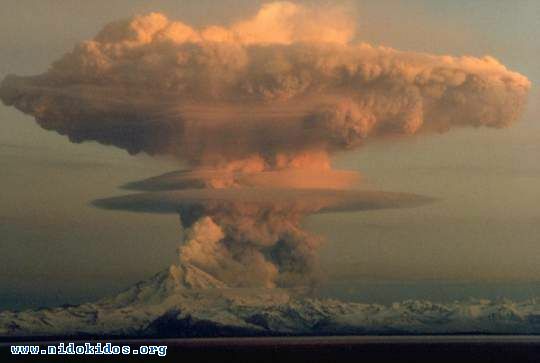 A probable explanation for not hearing thunder is related to the height of the cloud coupled with a very steep inversion, which is something common with Cumulonimbus, called "capping inversions" , the same capping inversions may also shrink the sun disk size, compounding the effects of a colder Upper Air. Vertical sun disk size measurements can help identify strong capping inversions which are symptomatic with severe weather outbreaks. Very very high red sun pillar, the highest one I ever seen, mid air just under the andvil seen an hour later than picture above, just after sunset, it is the result of refraction and ice crystals. As the andvil dissipates I see the mechanics of forming cloud seeds, along with the 50,000 feet new ones, in the background much older and higher cloud seeds loom, coming likely from even higher andvils or the equator. It is highly likely that cloud seeds are and will be more numerous, adding to the heat wave punch by extending the coverage of high altitude Cirrus clouds. This with a Negative Arctic Oscillation giving ice flows heading towards Greenland. In the recent past there was an ice shelf between North Ellesmere and Greenland with absolutely or very little buoy movements. 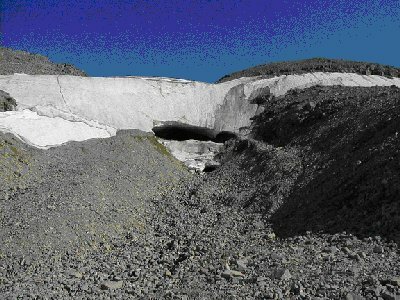 Now gone, the ice flow dynamics have changed dramatically making the Fjord Glacier shelves especially more vulnerable. 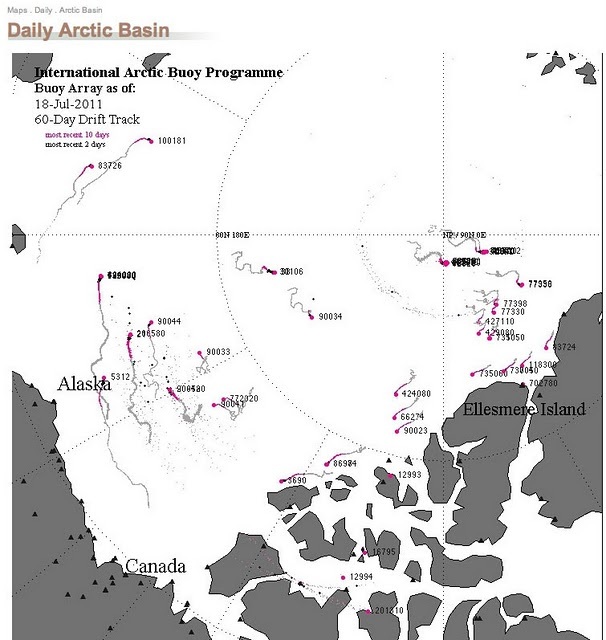 July same approximate date ice conditions suggest more clouds in the Arctic than in 2007. A good thing, over all clouds extent are imprinted by ice over the Arctic ocean, like a shadow of a person. I attribute this to burgeoning El-Nino. Watch carefully the sea of Kara area, the Island Ice barrier duo spared a greater melt in 2007, this may not be the case this summer. 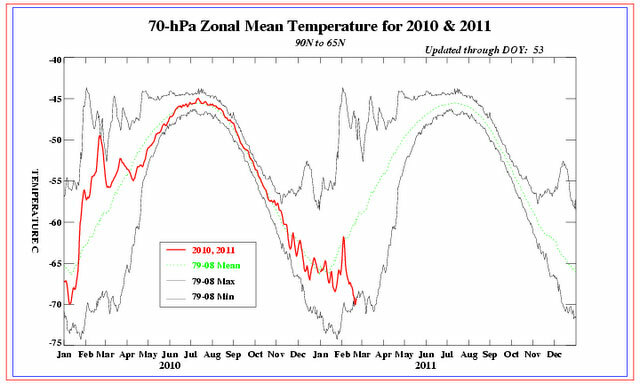 To recap, spring 2011 projection was off-phase due to a greater surface heat exchange than anticipated. However the projection was mostly correct about the general trends, which are for a great clearing following by a more cloudy end of fall and winter. As written last year. 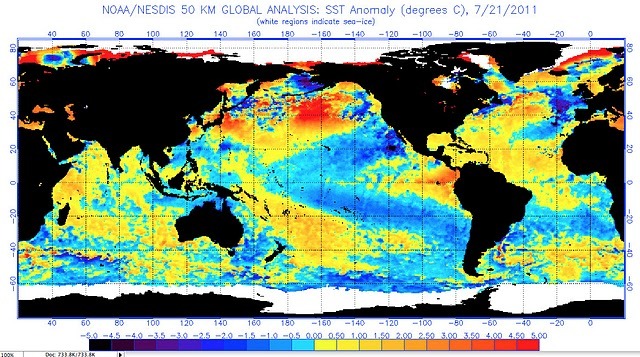 El-Nino will make a come back, and all indications are so. There were other predictions, of the PDO being in steep cooling decline to name one, they have failed along with La-Nina from beginning of the year. 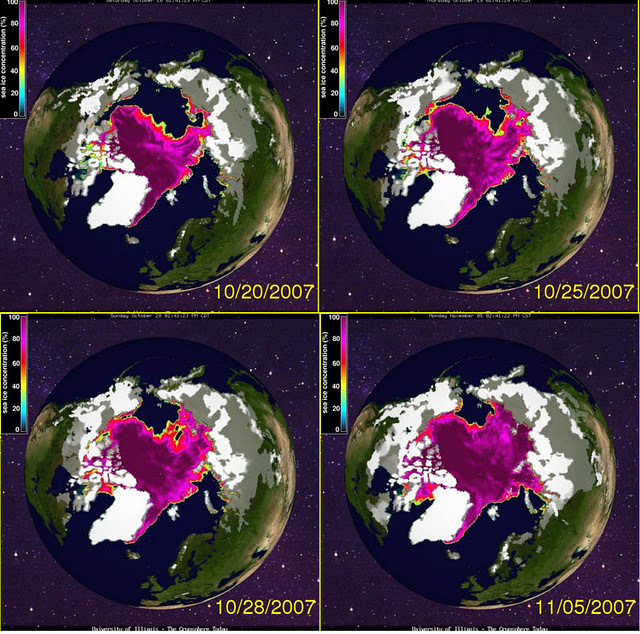 Which ultimately, without any doubt, with a great deal of assurance prompts the projection of Polar sea ice even further greatly diminished, to the point of making summer of 2007 event like a great deal of ice. I am more confident that there will be no ice at the North Pole next year if so, possibly even this year. 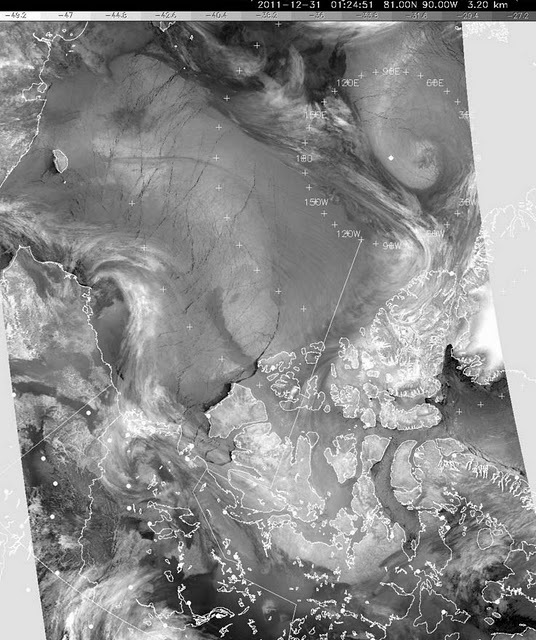 June 23 Cryosphere today map (right) shows the Northeast passage about to open 2 months earlier, again a PDO prediction utter failure (note the said link was removed, its not good to hide ones errors). 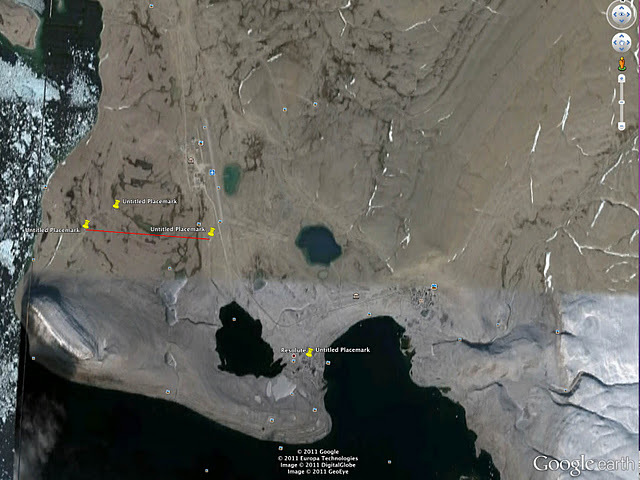 The stubbornly closed NW portion to the East Novaya Zemlya is already open. Exceptional event which should surprise Russian shipping experts. BOM shows El-Nino looming, but now again, is the matter of determination, will it go really strong? Australian bureau think it will be Neutral till year end, I disagree, all signs including low hurricane activity great rain events suggest otherwise A few evenings back I have seen enormous dark high elevation streaks during twilight over South Eastern Ontario. It appears as ominous, but I look for other conditions, having latest RATPAC data would be nice, instead we have UAH data, showing 10 to 14th warmest May in history, while January to May RATPAC is in 9th place compared to world wide ranking 12th place, which is at serious odds with the general wet weather spanning pretty much everywhere. Regardless, if the Upper air remains much cooler during summer, prepare for a strong El-Nino. On the other hand if the situation is reversed, a warmer upper air vs a colder surface atmosphere, this may mitigate and take off some El-Nino steam. Unlike UAH confusion, Montreal sun disk comparisons will reveal El-Nino's potential, predominantly very expanded sun disks may favor a moderate or weak El-Nino. Come July end, will have some data. In search of dark cloud seeds, on June 3 I observed what I saw from below, while flying over Northern Quebec near LG2 between 32,000 and 39,000 feet this picture was taken mostly at 35K. The dark streak above thin cirrus clouds opposite to the sun position was seen covering the entire province of Quebec longitude wise from Iqaluit to Ottawa. While moving southwards boreal forest patches appear to have melted snow cover first, gradually all ground was snow free eventually leaving the largest reservoirs or lakes with some ice, signs of winter vanished at the limit between the boreal and temperate forests. And it is. the mechanics of ascending cloud seeds in full swing. I would expect dark streaks to cover half the sky as summer progresses, in this case a Negative Arctic oscillation should exacerbate convection by easing more vertical upward motion at the equator. I explain this by a high at the Pole, low Sub-Arctic, High temperate and low pressure over the equator longitudinal system combination. June 5 2011.... You read it here first, despite what capable models were saying:-will add corrections more often when necessary. It's becoming obvious, from Pakistan, Australia, USA and Canada record flooding has become a frequent occurrence. Its not that they never happened in the past, its more like they seem linked beyond deforestation and riverside denser urbanization as a common thread. In the Arctic, where it sunsets no more, hard to see cloud seeds, will look at twilights elsewhere, in search of dark streaks. Big flooding does not surprise as much recently, not as startling as last year during La-Nina in full swing. But La-Nina didn't cool the entire Pacific, the sea was record warm near Australia, and the Atlantic was particularly warmest ever affecting its immediate regions. Since La-Nina fading away is twinned with a very cold upper atmosphere, convection appears very strong in the North American sector, I watch closely the beginning of El-Nino and see if more water is in the sky. For now , being blind makes me postulate sunset dark streaks should be seen, once clouds let their grip go, beyond 50% of the high sky from where the sun disappears to observers eyes , a bad foreboding for more water, will wait till I can see. Beginning La Nina 2010 spring. 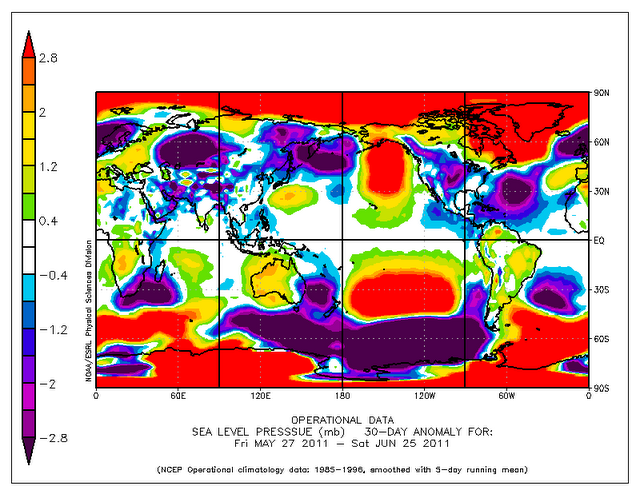 Its opposite, beginning El-Nino 2011. 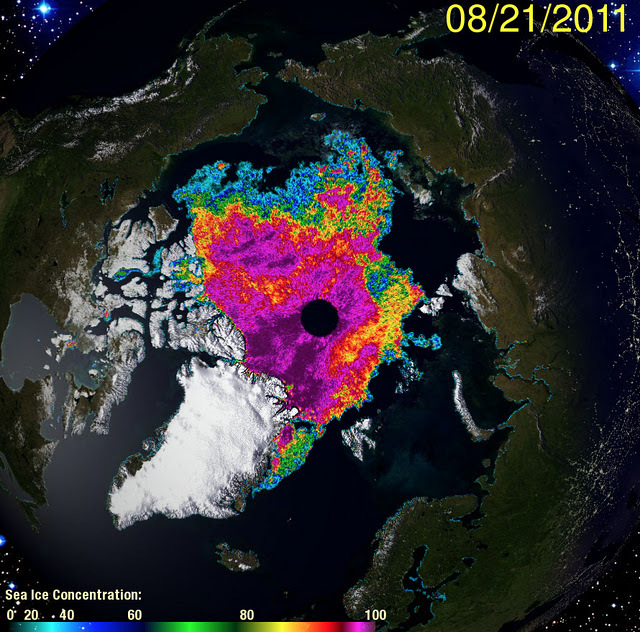 (NOAA daily composites 500 Mb May 1-20 2010 (left) 2011 (right). Cold upper air favors convection. After a great cooling of the equatorial Pacific, the cold air lingers above, ideal for vertical winds, when there is upper air warming, this vertical motion slows easing horizontal winds with strength. The stage is set powered equally from a once colder vortex. I would say ascension is favored, bringing along great thunderclouds and whatever they give. The key for a strong El-Nino is in place. Remains the summer to exchange heat from ocean to air. Along with this change comes the atmospheric circulation above the Polar seas. Its hard not to see a strong negative AO, a dominant anticyclone where it causes an entire Ocean gyre to turn its normal clockwise. Very bad for ice if so. It remains to be seen, literally from the entrails of twilight, how fast El-Nino shall return. 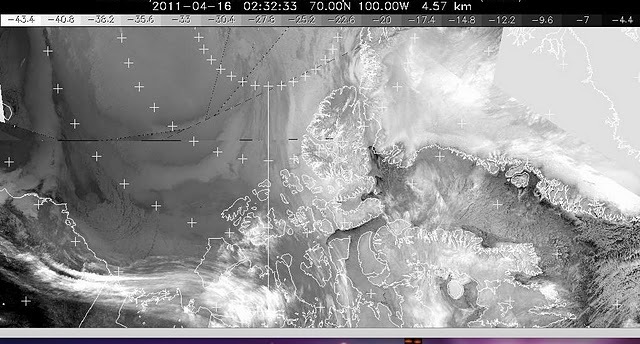 Courtesy DMI Polar NOAA AVHRR 2011-03-03 04:20 UT Amazing image for any with Arctic observation experience. Over the last 25 years this never happened. It is a sure sign of record thin ice. It very much appears like loose pack ice compared to adjoining older thicker ice. The proximity to Ellesmere of the zone where ice shatters and joins the North Atlantic was always at the North-East corner of Greenland. I dont recall seeing this kind of active ice so near to Canada by way of Northern Greenland even in the summer! 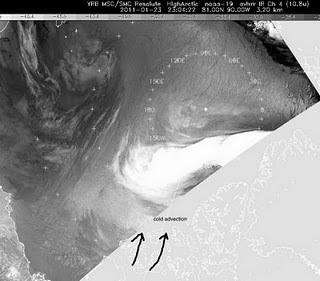 The winds from multiple cyclone incursions over the Arctic Ocean also played a role. The result of Arctic ozone depletion, quite unlike dark cloud seeds, they have moisture and shine very high unlike any. They are not dense reflect sunlight from ice crystals. 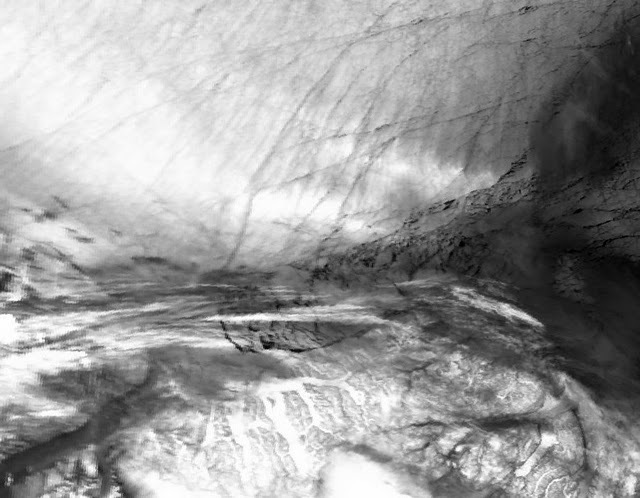 In this picture to the Northwards exactly where the center of the vortex was for most of the winter. Perhaps the biggest one in years, or decades, exceeding likely 1997, the very year which started the greatest El-Nino in history. Above, spanning a huge area, with winds in excess of 150 knots. Consequences of a monster cyclone like this have been and will be huge. They cool the upper atmosphere for a great chunk of the Northern Hemisphere creating stronger convection further even in the Arctic. As written before it made the Arctic colder in April, but was born out of great warm Arctic beginning of winter. A very high Tropopause exists colder with greater heights naturally, the stratosphere above much colder. 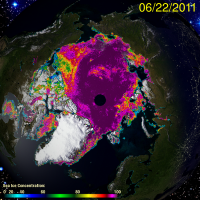 The photochemical process of ozone depletion starts to be severe below -80 C. As soon as the sun hit the Arctic stratosphere from the long Polar night, February and March, depletion accelerated, 1 free chlorine atom destroys 100,000 ozone molecules. Ozone being a very potent greenhouse gas, once destroyed within great air volumes, depleted ozone made the vortex even colder, winds speeds can exceed 200 knots, like a tornado lasting days. At the beginning of April , the vortex faded or disintegrated, there are two school of thoughts on how this happens. Mechanical shearing and simple heat from the higher sun warming up its center. Usually the Vortex is thorn to shreds by its own wind laminas and various height distributions around the pole. This year was not so simple. The rare very high but steady tropopause from very warm beginning of winter remained high even when surface conditions cooled a lot. These were ideal conditions for a strong long living vortex. It was made cold from heat, a contradiction demonstrating a very complex climate system. Perhaps more complex than most people can understand. Confusing things further, going back to the very beginning of winter, the cause for this early winter heat was thinner or no Arctic Ocean ice diverting the usual configuration of planetary waves steering warmer air away from Western Europe in favor of the Baffin area. It's a complex event, but at the end simple, unusual unseasonal heat may cause cooling for a large part of the planet, in this case the Canadian Archipelago was most influenced, the rest of the Arctic ocean remained much warmer by its vulnerable thinner ice. The earth's atmosphere is a very tricky thermodynamic engine having hundreds of smaller ones, colliding or complementing each other constantly, at times causing great variances. But at the beginning of this, the reason for this was thinner Arctic ocean ice caused by Climate change. Years of warming is transforming our climate to extremes not normally observed. becoming more common and appearing new. More than 300 observations of sun disks reveal a strange paradox, even if the Canadian archipelago is the only cold area in the Arctic, vertical diameter maximas just exceeded very warm 2010. This means ray paths, no shorter than 100 Km and at times more than 700 kilometers long, went through warm spots. Overall average ranks again 4th. Nothing has changed. 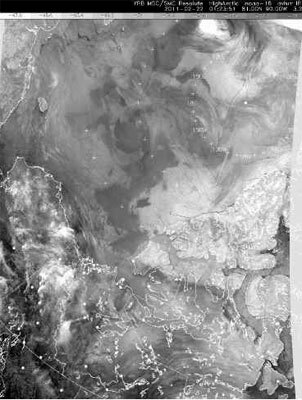 However a Vortex cold shadow "imprint" remained over the archipelago, making the canadian Arctic dead center of the cold temperature North Pole. This made Europe warmer faster than simply by frequent low pressure incursions at the Pole area. Of exceptional interest, the Arctic Ocean ice also received a farewell boost in extent by the vortex demise. But Canada will warm exceptionally quickly because the ice is thinner, with also El-Nino returning speedily, giving rainy end of spring beginning and a cooler by clouds summer. Ascension of further Pacific Ocean cloud seeds are already in place, convection from the much colder Upper Air will exacerbate El-Ninos return full force especially with lower pressures in the Arctic. With all the ingredients in motion, North Americas weather will be wet and as foreseen violent, with a break in more clear skies come mid-August onwards, followed by a very warm cloudy winter. The speed of El-Ninos return may put a dent in Hurricane numbers, this must be surely watched closely. Strong convection means really powerful hurricanes and typhoons, even if fewer are spawned than expected. Russia continues to be influenced by low pressure incursions at North pole, but this may stop in a few months, likely sparing the return of the great Russian heat wave. Arctic Ocean ice will remain fragile with a great initial melt stopped by greater albedo due to more cloud seeds. It was a short La-Nina, well foreseen, a success by understanding that low pressure at the North Pole combined with winter Upper Air are important elements affecting ENSO. Last 90 days North Pole region had one major Cyclone incursion after another, in effect shutting off the making of cold stable high pressure air, all this cycling in a feedback loop between lesser ice, low pressure and warmer air. At the equator, it seemed that easterly winds faded in strength, despite a very cold Pacific, even when apparently deeply endowed with cooler water, La-Nina vanished. 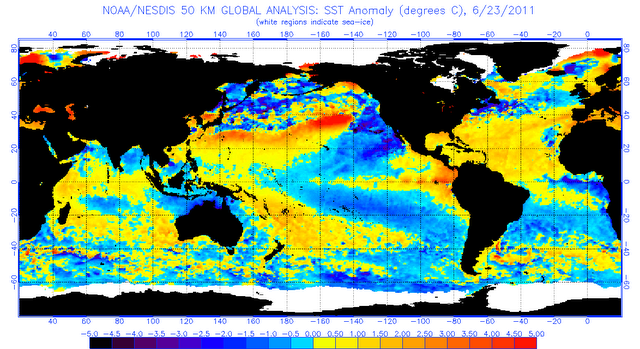 This leaves the problem of seeing how fast El-Nino will be back. 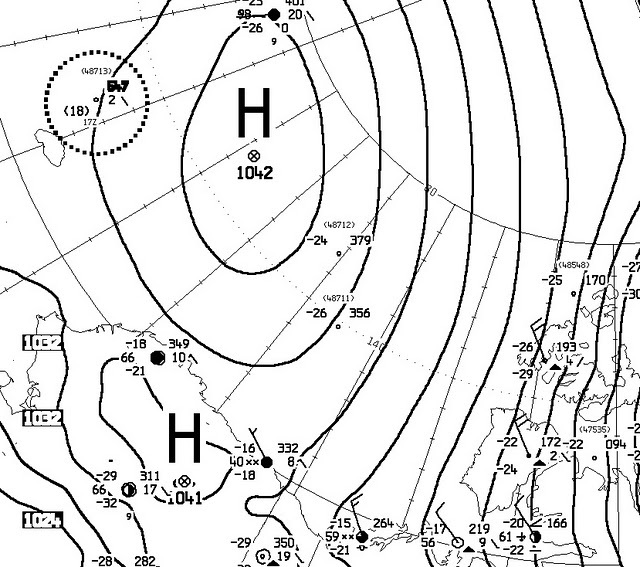 Arctic Low pressures have huge consequences elsewhere. If this continues, Europe in particular Western Russia, will be in the same predicament as last summers great heat wave, but first they will feel chillier by the very cold stratosphere just above, once the vortex finally expires the reverse will strike. Back home, the return of El-Nino will be key, as warmer waters ascend more cloud seeds, this may mean a wetter end of summer, the larger question is how favorable convection will be ....[general upper air trends by RATPAC] As seen before, convection may be in a world wide mode or not. Warmer water ensures convection, a much colder Upper Air doubles it, light or no surface wind triples it. Sun disk measurements reveal convection, if well expanded beyond average like during 2010, convection is not favored, if not so expanded like now, convection is in the cards. All factors seem to indicate it returning come fall, if not earlier. The Arctic vortex, RIP, recently passed away, was extremely cold. Surprising the Canadian Arctic with a colder than usual lower atmosphere. The echoes of this cold air will linger particularly in the Upper Air. causing more clouds than I originally expected everywhere over North America. A colder upper atmosphere causes stronger convection, this is bad news for stronger convection also causes greater severe weather. The stage was strangely set by all time warming in the Arctic until mid winter, the troposphere was largely expanded, eventually triggering a fierce vortex, because the higher the tropopause the colder the vortex which eventually had a life of its own. Falling over us in the High Arctic, distinct ice crystals, grainy, large, during clear blue skies. 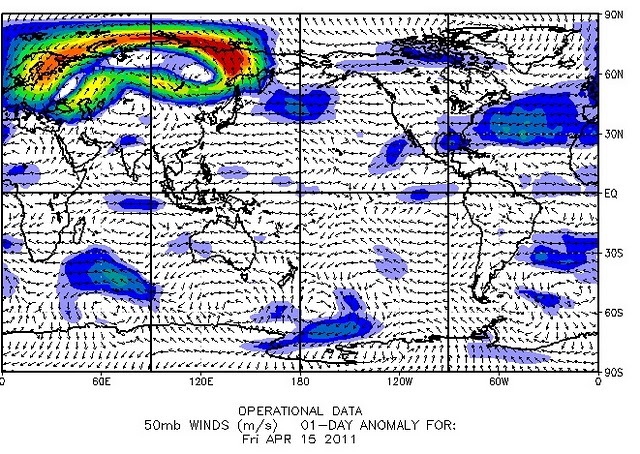 The Vortex at 50 mb. Suddenly quickly fading after a very intense lengthy spin, once with winds well in excess of 125 knots, it will die as if it never existed. 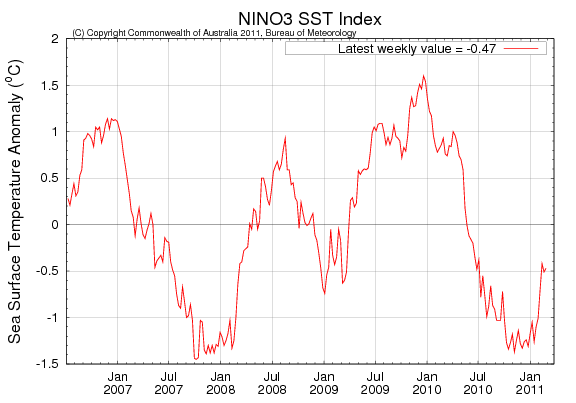 BOM shows El-Nino looming, but now again, is the matter of determination, will it go really strong? Australian bureau think it will be Neutral till year end, I disagree, all signs including low hurricane activity great rain events suggest otherwise A few evenings back I have seen enormous dark high elevation streaks during twilight over South Eastern Ontario. 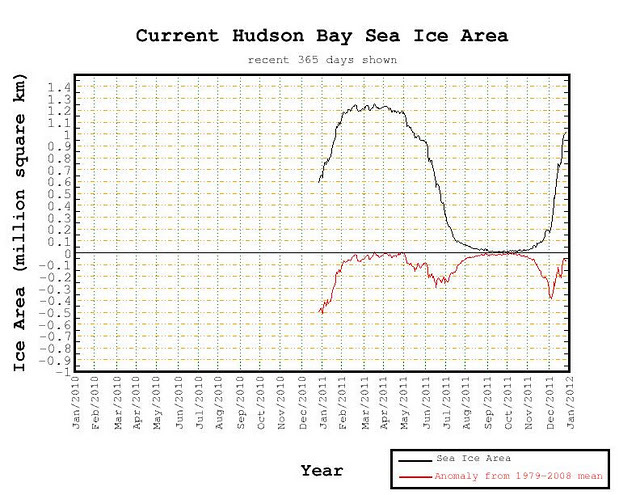 It appears as ominous,July same approximate date ice conditions suggest more clouds in the Arctic than in 2007. A good thing, over all clouds extent are imprinted by ice over the Arctic ocean, like a shadow of a person. I attribute this to burgeoning El-Nino. Watch carefully the sea of Kara area, the Island Ice barrier duo spared a greater melt in 2007, this may not be the case this summer. Unique or average Vertical diameters of the sun compared to same astronomical elevations from data base going from 2002-2010. 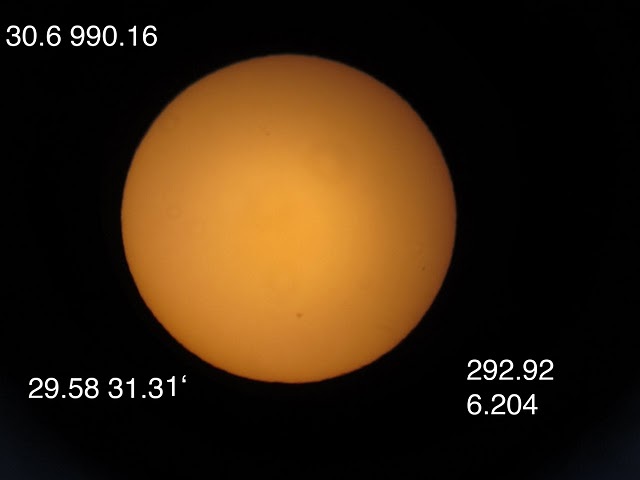 From 85 2011 sun disk observations between -1 to 7 degrees elevation. This with observations taken during near average surface temperatures. Which for most people was very cold, yet during measurement period, the tropopause was very high, a fascinating contradiction, a few days ago the warm troposphere returned, tropopause heights remained high, this is the key signature for 2011 Arctic atmosphere. Upcoming sun disk measurements will cover the "warm" winter remainder, it will be interesting to see if temperature rankings change. But 2011 is set not to be warmest in history. First look of "warm" winter sunset captured March 22, compared to fire on the ice event a few days before, its a round sun setting, signalling the passing of cold air, it coincides also with the start of the demise of the vortex, the clouds from the recent few days also clash with 2008 big blue days after a similar La-Nina demise. At the North Pole, great leads spring out at ice Maxima, never again seen, these leads release huge amounts of heat where its suppose to be very cold, From what I gather so far, the immediate impact of less ice volume is the warping of planetary wave positions, the usual La-Nina winter was no more for north America and Western Europe, I don't know about the rest of the world since I am not familiar with the climates there. But I strongly suspect the same shifts in patterns. 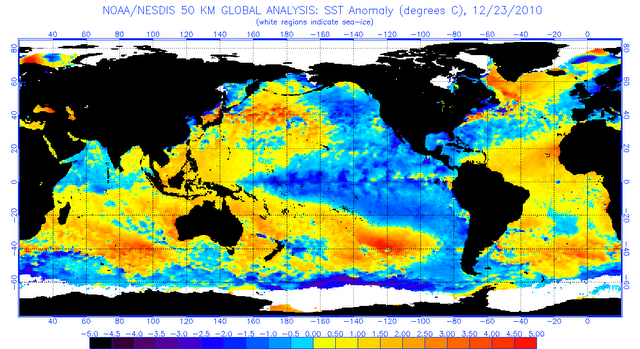 2011 is beginning to look as projected, leading the way for a new El-Nino. 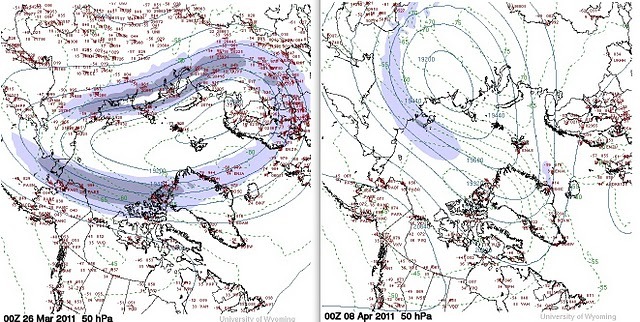 Big key is the repeat of big Arctic blue of spring of 2008, which so far failed to happen.. There was a small apparent lag of cloud free La-nina in origin Arctic cooling, but it was joined by stratospheric cooling . In 2008, big blue was really exhausting to cover, no clouds every day is not what we are having yet. Again, I suspect heat oozing out from usually ice covered oceans as distorting an easy theory of persistence call. But over all I am satisfied with last year projection for this winter to be mild twinned with Atlantic moisture havocs. Latest Arctic observations have shown remarkable cloud seed skies, the difficulty to distinguish between PSC's and lower stratospheric cloud seeds has been tentatively resolved, but still needs further observations. 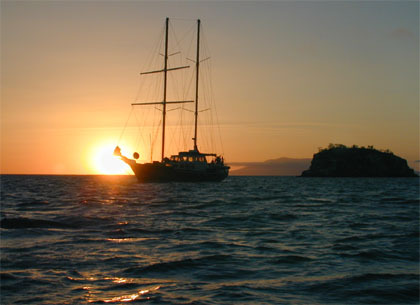 Ascension, is a key seed term, where as it happens less when the ocean is cool. In one month, NOAA , January , ascension has increased, through convection, very fast mode switching it seems. A small stall in ocean warming has just ended, leading to most to say bye bye La-Nina, Automatically ascension seeds spread worldwide by lower stratosphere currents. seen as far as in the Arctic. SST warming in the Eastern equatorial Pacific seemed very fast, with it lies the born again El-Nino, which will transform the coming fall and winter to a wet warm one. Back here in the Arctic, the immediate impact of less ice volume was and is less sea level pressure, 2011 similar to 2008. But 1998 same early period, had more ice, conversely more sea level pressure, simple concept makes it easy to understand; thick old ice has a closer IR signature to frozen land. Contiguous co-joining high pressure outbreaks to the South made winters much colder then. Again, forecasters ignore at their peril, the effects from a not so far spread out less voluminous Arctic Ocean ice sheet. For the coming spring and summer, less sea ice automatically makes these seasons warmer, but there is this La-Nina lag combined with stratospheric cooling, both are just about to dissipate, in their wake clearer skies with great potential for strong convective events. Refraction sun shots were so far not numerous as per preceding years mainly due to clouds, must wait a few weeks to confirm the coming mild weather as foreseen last year, so far, 4th place temperatures seem to hold. It was a very complex Arctic winter, mainly warm, then only cold for a month and a half, the net effect is seriously studied now. 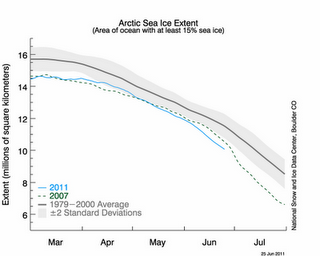 Arctic ice of the NW passage is as thin as last year, but March 2011 is colder than March 2010. This means we can see "fire on the ice". Just the day before, the horizon was confused by water skies, from leads just opened, but they froze. -1.73 degrees sunset is a moderate one, in between extreme cold and warmer sunsets. This does not announce a return to colder climate, it merely reflects a very cold stratosphere, colder than -80 C just above, with a vortex raging strong, like during the spring of 1997, the year when El-Nino was strongest in history. Truly low Arctic sea ice extent at yearly Maxima, opposite to last year, the positive outlook is a continuance of low pressure presence near the Pole. 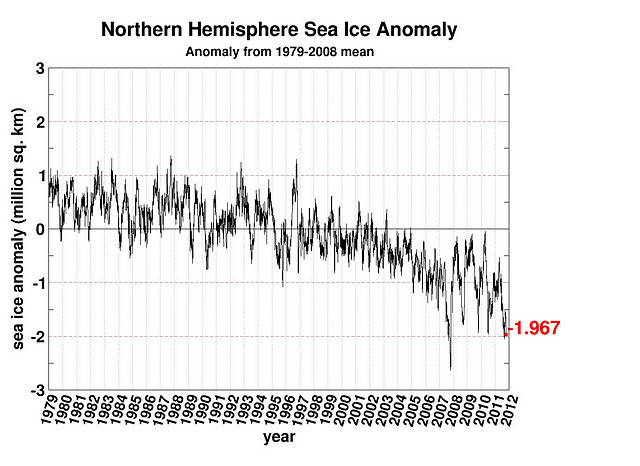 Which abruptly happened by about August having spared sea ice to shrink further to an all time low. However, all these surface cyclones combined got the sea ice to its present state, at its heart, the fuel for these, the thinner sea ice and open water. Going back to above, the vortex spins to its death in light blue hues, when doing so, it will unleash whatever seeds it turns, at present moderately cloudy despite La-Nina lag gives a big blue small version without the high pressures. In here lies the great contradictions at play, NOAA's Polar 70 mb temperature is near all time Low's. we see in part the reason for the vortex, its cold due to darkness, southern warm air flows to it, but in summer these hurricane winds die, stratospheric temperatures are more even with further south, But the contradiction, as with Antarctica vs the Arctic, like the Glacier vs the thinner lesser sea ice, cold from above faces the more exposed much warmer sea, a recipe for skinny clouds awaiting more agglutination particulates. 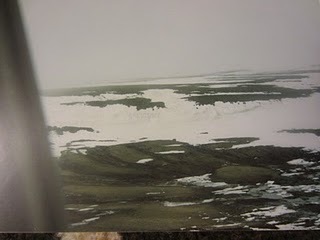 Early Arctic spring is usually very cold and mostly cloud free, in the spring of 2008 that was an understatement, clouds were scarce, Arctic "bush" pilot flying times went uninterrupted for months. It was seasonally cold, especially over the Arctic Ocean. 2011 to date differs greatly with that respect, its cold over the Archipelago for the first time this winter, but there are clouds, even just like the satellite picture depicts, not too bountiful, enough to transform the usual end of winter image. This is unusual in the wake of a dying La-Nina, all throughout the world, rain, snow in record downpours, still strange, which brings back to the suggestion, La-Nina really didn't vent out as did so in 1999-2002, it got interrupted by Lows at the North Pole, and a very warm world wide sea surface. 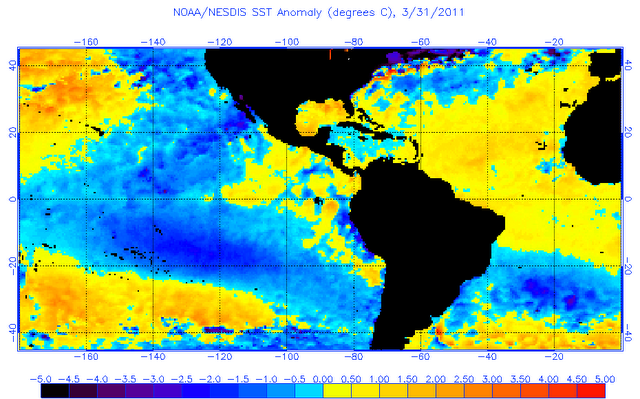 So we see spring 2008 twin 2011, part ways, leaning towards El-Nino even more faster than most models predicted. 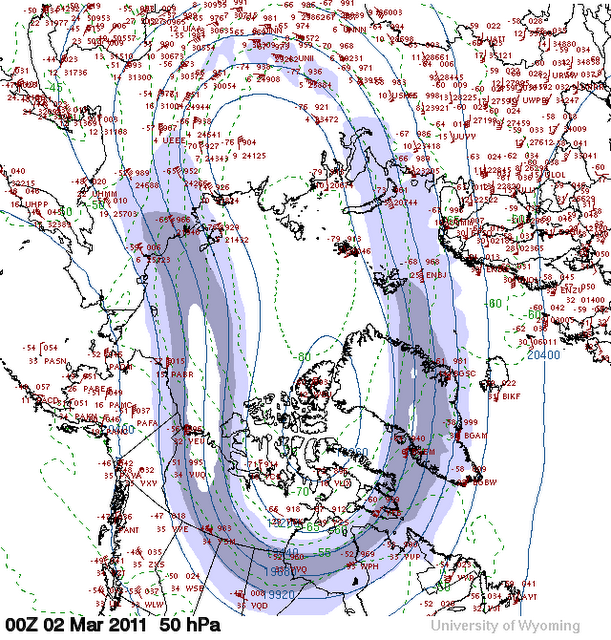 The Arctic stratospheric vortex shows strength, unlike 2008, still cold, with fierce winds, in its eventual demise. more clouds will settle suddenly help Arctic Cyclones consolidate more.. Not bad news for sea ice, critically low in extent nearing winter Maxima. About the cold weather in some parts. like in San Francisco, its not as strange as planetary waves going really stretchy, deformed, not like a normal winter pattern, its a spring or fall formation, however with cold winter weather still spread out, thinned, making some parts colder than usual others much warmer, Again most weather experts neglect the effect of thinner Arctic sea ice, particularly deforming planetary waves deform themselves further in an Arctic cyclonic intrusion feedback loop, wave after wave of cyclones penetrate fortress winter over the Arctic Ocean. Unusual at mid winter, everything is distorted inviting temperature extremes to be the norm. La-Nina of 2010-2011 is giving trouble to Australia and Brazil, coupled with extreme snowfalls in NE coastal North America and even Northern Europe. All are linked, because of the influence on planetary waves a much cooler equatorial Pacific offers. But Equatorial heavy rains pose a contradiction of sorts when the greater Equ. Pacific is colder, there has been a probable signal of new generation of cloud seeds, which should give special features during twilight skies, from the few images of twilight I looked at, the Equatorial Pacific is loaded with cloud seeds. Recent pictures would be most interesting to study and especially show. The Atlantic is still quite warm. Heavy snowfalls On US/Canada East coasts are not a surprise. La Nina's usually change planetary waves as such making the NorthEast coast out of the way of heavy winter snowfalls, but something has changed planetary waves, this was missing Arctic sea ice, literally re-shaping La-Nina patterns. As Arctic sea ice regains its normal extent, La-Nina events should be more normal, but then again La-Nina appears to fade, so I expect a short "normal" La-Nina winter. Heavy rains in Brisbane, Queensland Australia were very interesting, given very warm waters off Eastern Australia coast during a La-Nina. I take this 2 ways, first the heat exchanged from Ocean to Atmosphere during El-Nino was not as strong as 97-98, since 97-98 had a very warm El-Nino, warmer than 2009-2010, also since the planet is warming, there is simply more heat in the oceans, especially because less heat was exchanged in 09-10, logically El-ninos should exceed 97-98 heat exchange, but it didn't happen, this is not a good thing as people affected by extreme flooding have witnessed. Is it possible as well that particular seeds are surfacing from equatorial Pacific ocean? Not only affecting the Pacific region, but world wide when the next El-Nino starts. Switching in progress? Lets confirm in another month. "Warm" Gyre Anticyclones North of Alaska in total darkness! 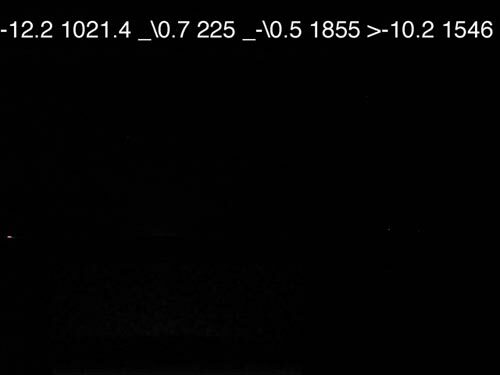 Even at 1060 Mb it was warm, with no clouds, no sun, but much thinner ice. A year later when the average pressure was higher, the temperature way warmer, in pure darkness, with more radiation escaping to space, fascinating, only advection of warmer air and thinner ice can cause this anomaly. In my experience a High pressure over the Arctic ocean causes massive cooling. More than a week later , cold air advection from the South, once again, unusual for the Far North to be cooled from the South, winter has finally started to be consistent, many weeks late. 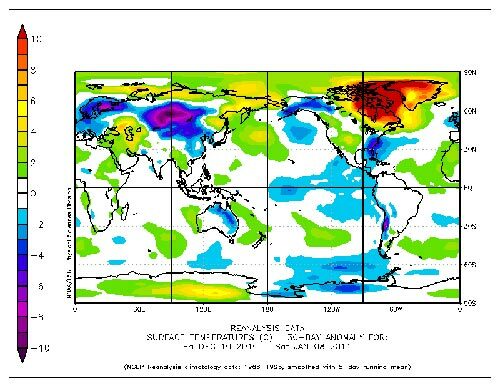 Note again near Russia coast warmer air along with myriads of Arctic Ocean leads, for late January of old this was unthinkable...The highs of the Arctic Ocean didn't cool the world as they should, this changes planetary wave configurations. Again from ice too thin. NASA just released their end of year report, 2010 is warmest, declaring it tied with 2005, I suspect NOAA a little off, since sun disk measurements in two different climate zones had overwhelming expanded (warming) results. All was predicted here way back in the spring of 2009. Reconfirmed in March of 2010 by vertical sun disk measurements. Along with Northern Hemisphere #1 warmest in history . 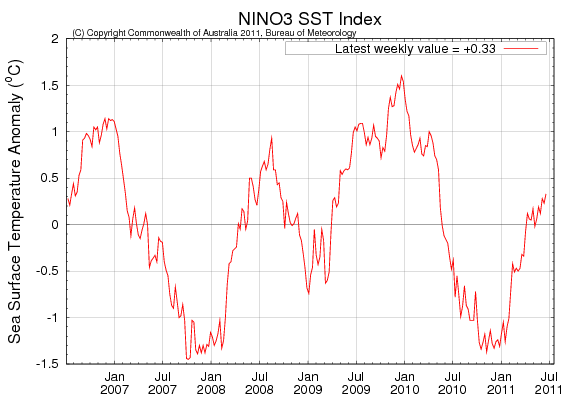 Remember El-Nino just past was not as strong as 1997-1998. 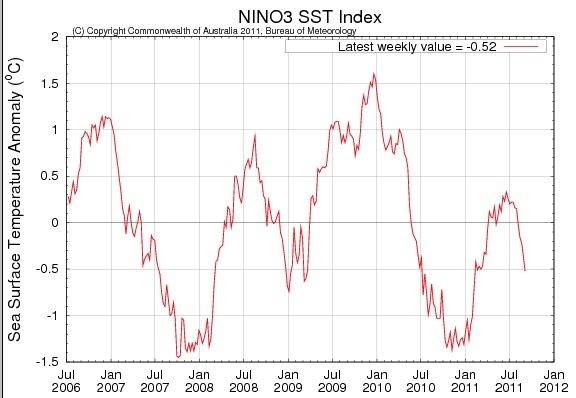 The Global warming signal is found this way, the temperature difference between El-Ninos reveals the signal. 1997-98 El Nino averaged 2.3 C while 2009-10 averaged an equatorial sea temperature of 1.8 C, yet the world average temperature climbed by +.13 C. The Pacific potentially exchanged +0.5 more in 1997-98 yet Global temperatures rose with a lesser exchange in 2010. This suggests a greater rate of GT increase per decade. Likewise as observed by sun disk measurements. It also suggests that the sea has absorbed more heat without releasing it. This TV broadcast is more direct. 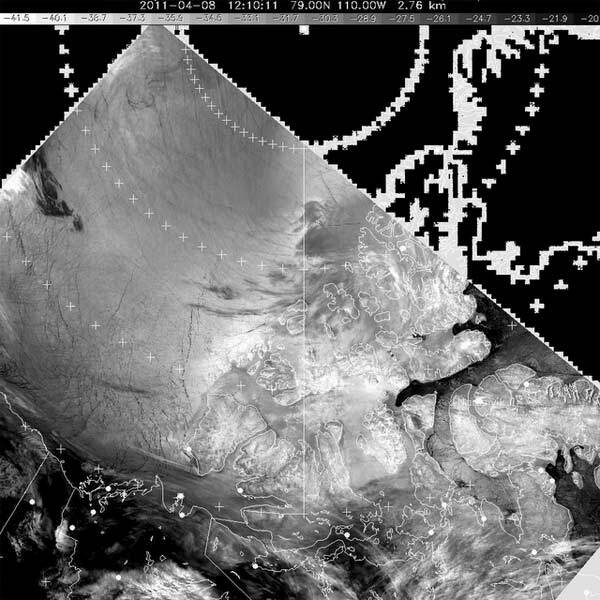 Again Optical Meteorology proves its potential, of which many facets were expanded in 2010. 2011 EH2r page will have a link for latest fast news, responding to articles related to this body of work, or will display the construction of the next EH2r news article. Of which apparent recent La-Nina fading at December "switch" time, is of interest. Since it confirms yet another prediction, made during fall 2010. Again, predictions are made here as a confirmation of theories, which have merit if projections come true. There is much work to do with cloud seed observations, which may be key in helping understand ENSO. Latest Wegener near light displacements is equally very exciting, because it helps decipher low atmospheric profiles instantly. For the scientifically inclined read Dr Young's excellent web paper. This slide show demonstrates what happens at the distant horizon. 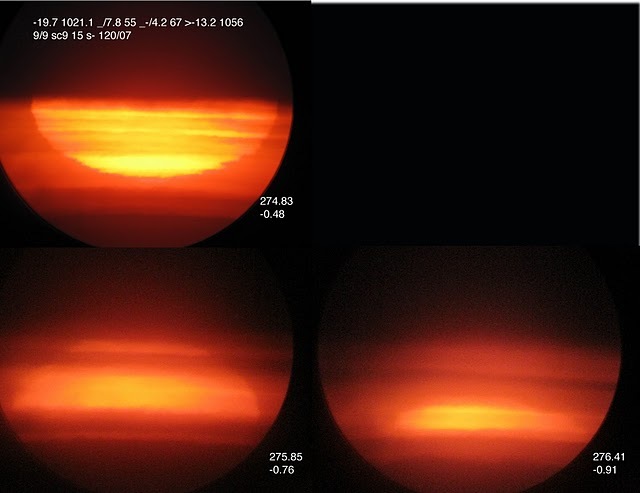 If the sun is below the horizon it may be brought upwards by refraction when inversions exceed 3.4 C/100 meters. On the first picture, marked by red borders, the light goes straight up behind the bluff, it cant be seen, weak inversions don't bend light enough. The last picture has a powerful duct, of which light travels like a fiber optic line. The camera is in the duct, it captures the brightest light of this slide show. This experiment introduces you to "Meteorology by way of light". Which any light source may give away the nature of the air in your vicinity. At any location of the world. As long as the light source position is known geometrically, "relativistic" light refraction betrays what is going on in the lower atmosphere. 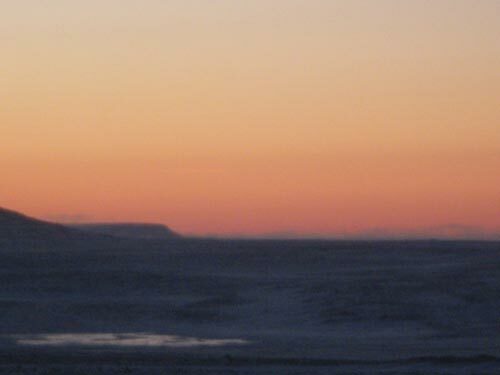 In the case of brightness during darkness in the high Arctic, the higher the temperature difference between ground and maxima aloft, the greater chance there are ducts, great bending of light, raising the horizon. Raised twilights appear more often at the beginning of Arctic winters recently (for about 10 last years), despite thin ice, because of warm air advection incursions, disturbing the usual strong cold surface air build up during the beginning of the long night, after an incursion this warm air always settles aloft, this causes huge temperature differences, creating the witnessed brighter horizon light. Arctic, sea ice of old was much thicker, creating less Horizon brightness, because there was less open sea water, inherently from the presence of much thicker ice spanning vaster areas of the old Arctic, warm air advection incursions were reduced then. During the not so long ago Arctic springs, the rising sun warmed the Upper Air and caused huge refraction effects. Sunsets or sunrises were seen much later and earlier than thought possible. 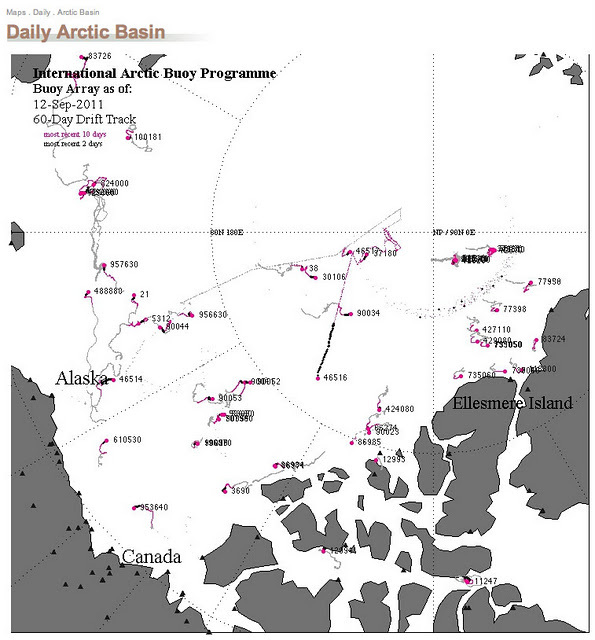 This happened because during old Arctic spring days, land surface air was similar to very thick sea ice surface air. During more recent years, the sunset and sunrise positions were shifting South due to a lesser temperature difference between Upper Air and surface air warmed by thinner ice caused by Global Warming. 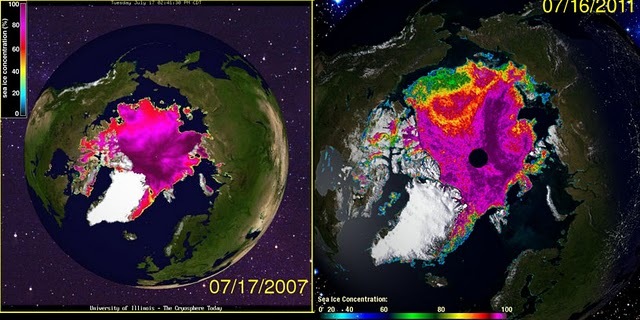 Even this has changed, because open water is now cracking through thinner Arctic ice in spring, never seen before, these extensive ice openings cause very significant just above ice inversions, despite Global Warming, some spring time sunsets are now seen blurry, shifting northwards, appearing as nebulous clouds, as caused by water skies. Camera settings are identical with all dark pictures.. To the extreme left, truck lights, the tower red light appears as usual to the right, but no light is seen behind the bluff, this is because there are no significant inversions, with a surface to maxima temperature difference of a mere 2 degrees, this is expected. It is extremely warm, more than 20 degrees above normal. Overwhelming warm air advection basically destroys inversions, this is a rare event during past high Arctic January, made so common recently. The next day, cold air moved on the surface, a very low strong inversion was created, surface to max temperature difference was 11 degrees. The hidden bluff light rises, without snowing, it appears lonely. Just a few cm above camera position the light looks even more bright. The duct is just above the camera. 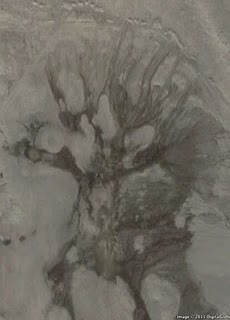 This inversion is a product of open water heat, so prominent the day before, being pushed away. On this day, the horizon was brighter. Wegener's theory stands strong. I find close by lights so much easier than deep horizon features, where all kinds of other air structures may interfere a proper analysis. This basically proves the bright horizons of late, but there are even more evidence, but I repeat again and again observations, the more I do, the less chances of misinterpretation.